Putting together a healthy, simple dinner shouldn’t feel like swimming upstream. Few foods pack a bigger nutritional punch than salmon—it's rich in protein, heart-helping omega-3 fatty acids, and vitamin D. When cooked properly, and married with the right flavors, the fish is moist, buttery, full of flavor and the perfect addition to any low-calorie diet plan. Béarnaise is the epitome of French sauces and just one of the many reasons to love classic French cuisine. Paired with fresh wild Alaskan salmon and served for your Sunday meal, it will give you the stamina to get through any week. If you don’t have any stock, poach the fish in a mixture of white wine (not superoaked Chardonnay) and water. Add a few herbs, like thyme, bay leaves, and parsley, to the liquid. Just try this melt-in-your-mouth and tasty recipe anytime! 1) To make the sauce, in a small frying pan set over medium heat, combine 2 sprigs of the tarragon with the white wine, vinegar, and shallots. Simmer for 5 to 8 minutes or until the liquid has reduced by about two-thirds. 2) Remove the tarragon sprigs and transfer the remaining liquid to the top of a double boiler set over medium-low heat. Improvise if you don’t have one by setting a metal or heat-proof ceramic bowl over a pot; just be sure the water on the bottom of your double boiler is barely simmering and is not touching the bowl you’re working in. 3) Before the reduction liquid begins to heat up again too much, whisk in the egg yolks, one at time. Heat the mixture in the double boiler for 2 to 3 minutes or until it’s quite hot and has thickened to the consistency of heavy cream. 4) Add the butter, one chunk at a time, whisking all the while. When all the butter has been added, turn off the heat and remove the top of the double boiler from the bottom. Stem and then chop the remaining 2 sprigs of tarragon. Whisk them into the mixture along with the salt. 5) To cook the fish, pour the stock into a large, deep sauté pan and set over medium heat. Bring the stock just to a simmer and gently place the fish in the hot liquid. It should be almost submerged, depending on how thick the fillets are. 6) Cover and cook at just a simmer for 6 to 8 minutes before checking for doneness. The center of the salmon should be dark orange, not light coral, and still translucent. A paring knife should go into its center without resistance, however. 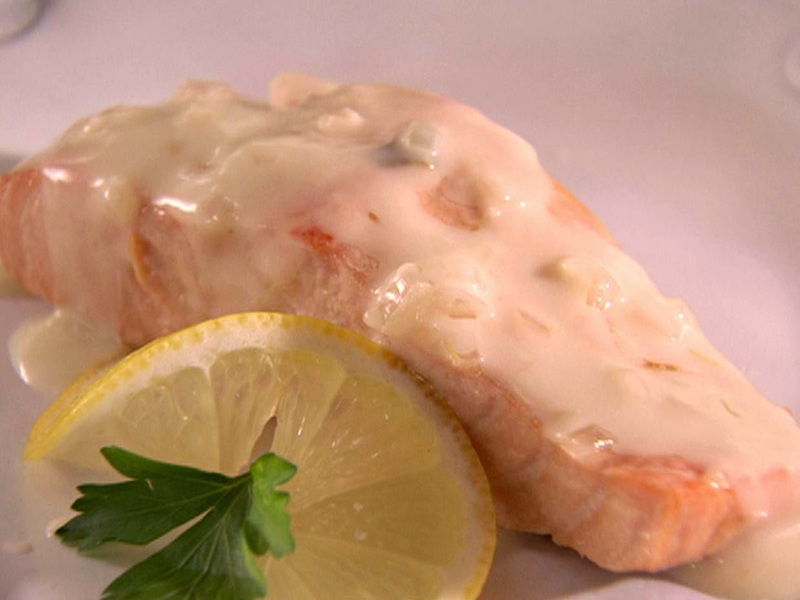 7) Gently transfer the fish to warm plates and just before serving, spoon the béarnaise over the top of the fish. Bring any leftover sauce to the table. Look for wild Alaskan salmon or farmed coho salmon or Arctic char. Avoid: farmed Atlantic salmon. Simple and fast, this is the perfect of side dishes for your wild Alaskan salmon if you’re looking for a vehicle for that tasty béarnaise. 1) Preheat the oven to 500°F/260°C/gas 10. 2) Fill a large saucepan with cold water, add the potatoes, and place over high heat. 3) Once the water comes to a boil, lower the heat to keep the water at a steady simmer and cook the potatoes for 15 to 20 minutes or until they are tender but not falling apart. Test a potato by inserting a paring knife. There should be little resistance. 4) Drain and place in a large mixing bowl. 5) Add the onions, olive oil, and salt and toss. 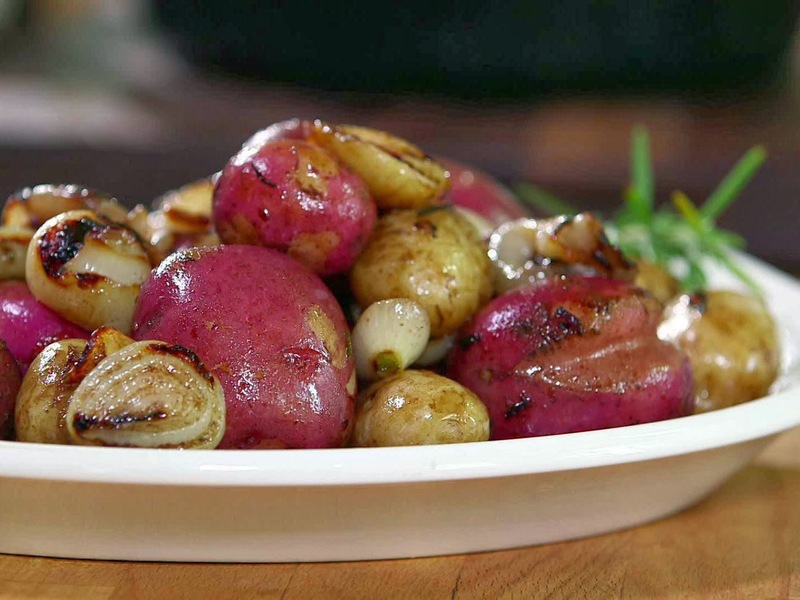 6) Spread out on a baking sheet (parchment-lined, if you like), and roast for 12 to 15 minutes or until the edges of the onions and potatoes begin to brown. Don’t be hasty and take them out before they show some color. If you haven’t guessed as much already, I have a thing for arugula. This is just an excuse to eat it, mixed in with shavings of umami-inducing Parmesan. 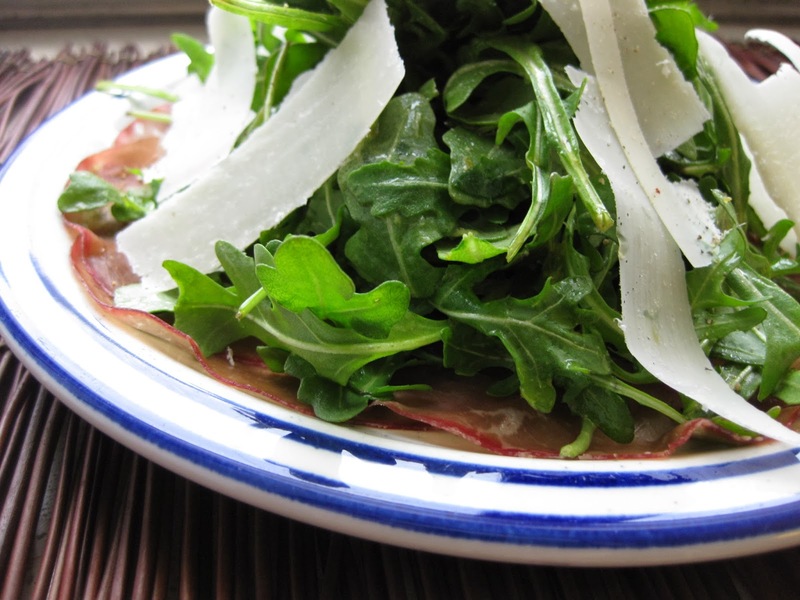 Arugula low in Saturated Fat, and very low in Cholesterol. It is also a good source of Protein, Thiamin, Riboflavin, Vitamin B6, Pantothenic Acid, Zinc and Copper, and a very good source of Dietary Fiber, Vitamin A, Vitamin C, Vitamin K, Folate, Calcium, Iron, Magnesium, Phosphorus, Potassium and Manganese. Just before you’re ready to eat, in a large serving bowl, toss together the arugula, olive oil, lemon juice, and a tiny pinch of salt—remember, the Parmesan is salty. The arugula should not be weighed down—instead, it still should be light and airy, with a fine glisten of oil. Scatter the Parmesan over the top and bring it to the table. If you can make chicken stock, you can make fish stock; just decide you’re going to do it. When you taste this rich, fragrant liquid, you won’t regret it. Most fish shops will happily give you a big package of fish heads and carcasses. For the lightest, most versatile stock, ask for non-oily fish. 1) Place the fish parts in a large stock pot, pushing them down to condense them. Cover with cold water and then add the celery, carrots, thyme, parsley, leek, and white wine. 2) Set over high heat to bring the liquid to a boil, skimming away the foam (and scum!) that rises to the surface. Once the liquid reaches a boil, reduce the heat to produce a quiet simmer. 3) Cook for 30 to 40 minutes and drain through a fine-mesh colander (use a regular colander if necessary). Transfer to storage containers and freeze or refrigerate any stock you aren’t using right away. Are you into the new fad diet out there? So it's a must that you should know the Top 10 Best Diet Plan in United States According to Google. Find food pictures and food photos for widescreen, full screen, high definition, dual monitors and mobile phones at Food Wallpaper Download Free.